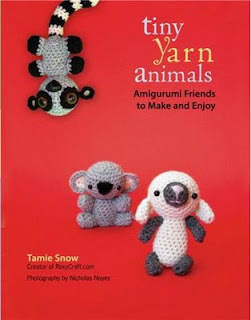 In theory, these little critters are not difficult to make, in that they do not use complicated stitches. Just single crochet 'round and 'round. What I needed was more specific directions: sew "x" in "y" position; count x number of stitches to insert arms, legs, tail, whatever. You don't get those directions in this book. The instructions are not very well written, period. I started with the Lemur, because my (grown) daughter said "hey, a lemur! how cute" and I said okay I'll make you one. This is my second try. On my first try, I used the size hook specified and worsted weight inexpensive yarn (which she said was just fine, even recommended). I got the size eyes and nose suggested. I got the body and head done. The eyes looked extremely tiny on the head, as did the nose (I didn't permanently affix them). You see, she says gauge is not important. Uh... uh huh it is!!! So I switched to a smaller hook and different yarn. Finally the eyes and nose looked more proportional. 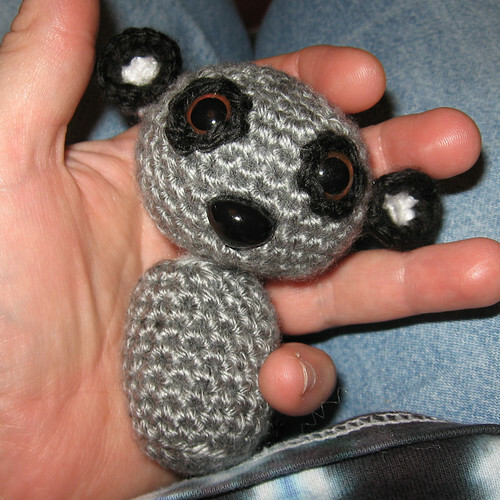 I had crocheted the black spots that the eyes were suppose to rest on and it said "insert doll eyes". Um. Insert the eyes into the spots? or into the spots and the head? Because the head instructions said to insert doll eyes before stuffing, if you were using purchased doll eyes. The doll eyes' post was not long enough to go through the spots and the head. So I inserted the eyes into the head and embroidered the ring around the eyes with yarn. Next time, I use felt for the spots. I still need to crochet the arms and tail. How do I determine where they will be sewn? Look at the picture, I guess. Sew appendages to head and body. Weave in ends." Hello, I have nominated your lovely blog, for an award. If you would like to participate, in passing it on, you can view it at my jewelry and gemstone blog. Have a great day. Thanks for the mention and the link. Congratulations on your first attempt it looks great. I have to laugh because when I look at your NEXT post, it's talking about laughing. I'm sorry. I wasn't suppose to laugh at this post. I do feel for you. As someone who has followed and written patterns, it is sometimes difficult to explain something you do all the time, but it really does sound like the directions were very vague. He does look really cute what you've done so far! His head looks good! I hope he finished just as good. Melissa, thank you very much. I'll have to get to that tomorrow if I have time. rockcreekcreatons - it's quite alright to laugh!! If I weren't an experienced crocheter, I would not have been laughing at all, though. As it is, I was able to laugh - and shake my head, too! !